The potential for a slingshot move has not been negated. 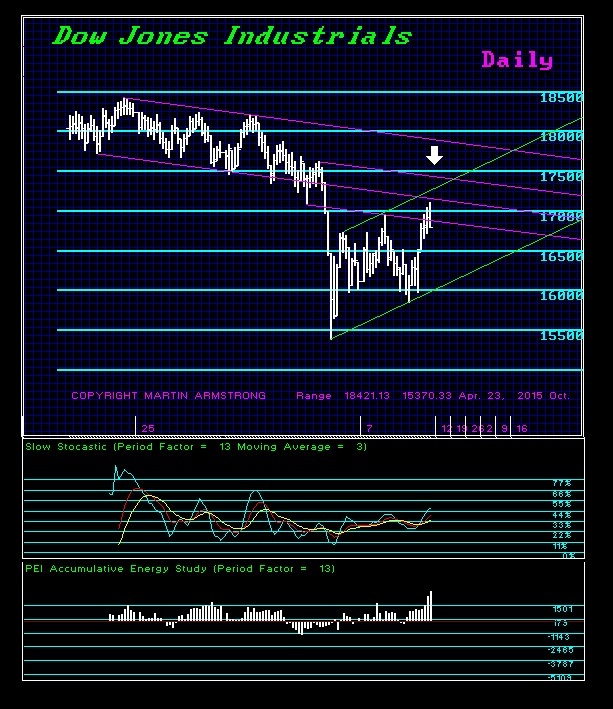 To negate a slingshot, we need a daily closing in the Dow above 17735. If we have the slingshot and trap the majority, then we should see this rally fail and new lows by the first quarter. Can we merely go into a Phase Transition without the slingshot? Yes. That would require a key annual closing and consolidation into the first quarter before electing the Weekly Bullish Reversals. Either way, it still appears that we will have that shift from public to private assets and the quantitative easing has shortened the duration of the debt so the slightest uptick in rates will have devastating effects. Even in Britain, Osbourne has doubled the national debt at these low levels of rates. Can you imagine what will happen when rates are forced to rise? The exit from public assets will become a huge one-way street. This is how empires fail and die. We deserve what we get by filling government with lawyers who assume the answer is more laws to dictate to society.